Computers can wait. Grades K-3 are for learning other things. Don’t fall for the notion that the teaching of handwriting on paper in the early grades should be replaced by computer instruction. Reading fluency depends upon familiarity with the letters of the alphabet and the sounds they represent. When children learn to form the letters with a writing implement held in their hands, they are laying down essential patterns in their brains. Research shows that handwriting instruction and practice contribute to reading fluency and critical thinking skills. High school and college students who take class notes by hand absorb the content of a lecture better than those who take notes on a laptop. Handwriting is also an extremely personal attribute. Children should be given the opportunity to develop an individual and beautiful handwriting. A fist-grip is normal in a toddler but unfortunate in a schoolchild. As fine motor skills develop, children can be expected to learn to hold a pencil or pen with a tripod grip. The tripod-grip is the most comfortable and least fatiguing way to hold a pen. Children can master it in elementary school. This was written by a five year old. Not every child will develop a beautiful handwriting as an adult, but every child should be given the opportunity to try. 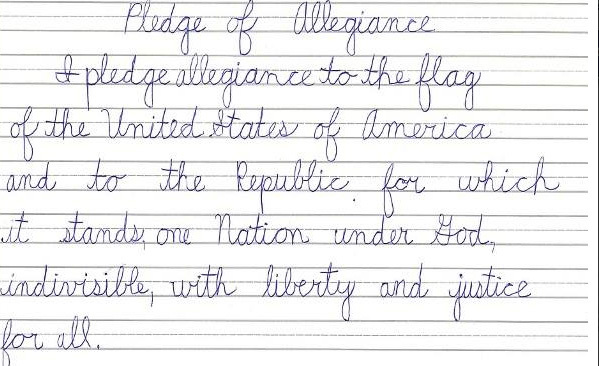 Handwriting can contribute greatly to a child’s sense of identity and accomplishment.